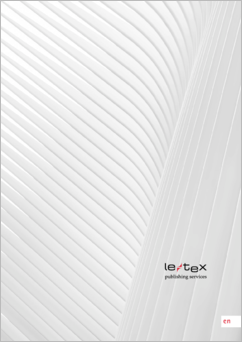 le-tex was founded in 1999. Its predecessor companies had been working in the scientific typesetting and copy editing sector since 1993. SGML has been an integral component of the company's production since 1996, and XML/MathML since 1998. Production editing has been developed as a business segment in its own right since 2001. “le” is not pronounced like the French article, but like LA (Los Angeles), with the "E" pronounced in the German way. This LE sounds like a German from Saxony would pronounce LA, Saxons being known for their distinctive pronunciation. Saxony is of course the German state where Leipzig is located, and LE is an affectionate abbreviation for Leipzig with delusions of grandeur that – in a tongue-in-cheek way – puts Leipzig in the big league with cities like LA. It was made popular in the 1990s by the city magazine Kreuzer. “tex” is derived from the typesetting system TeX. One of the particular strengths of TeX is math typesetting and it is a system that le-tex and its predecessor companies have been using since 1993. According to TeX inventor Donald E. Knuth, TeX is actually pronounced [tɛx] (with a ch as in the Scottish word “loch” and not as in the German word “ich”). He also writes in his TeXBook, however, that the “ch” is pronounced as in “blecchhh”! Many German-speaking users prefer this [ç], including us. To pronounce le-tex completely correctly, you must put the stress on the E of LE and not on tex. le-tex took its subscript e from the typesetting system TeX. le-tex now uses other typesetting systems as well as TeX, and also offers a comprehensive service spectrum in addition to typesetting. The design was developed by Marcel Langer for le-tex. From the paper analogy and stylized book spines on the left to the two open books flanking the hyphens in the logo, it contains numerous references to the industry that le-tex operates in. The spot color red (HKS 15) is also an allusion – to the color commonly used for handwritten corrections or the spot color of the initials on old prints. The technology behind this website demonstrates le-tex's approach to media-neutral publishing.